The revolution beginsApolla Shocks are everywhere right now. Your favorite dancers on “So You Think You Can Dance”, on tour with “Shaping Sound”, at conventions, in class, and on competition stages. These dancers are not just wearing socks. They are wearing Shocks! What do all these dancers know that you don’t? Why are they building such a strong and loyal customer base? 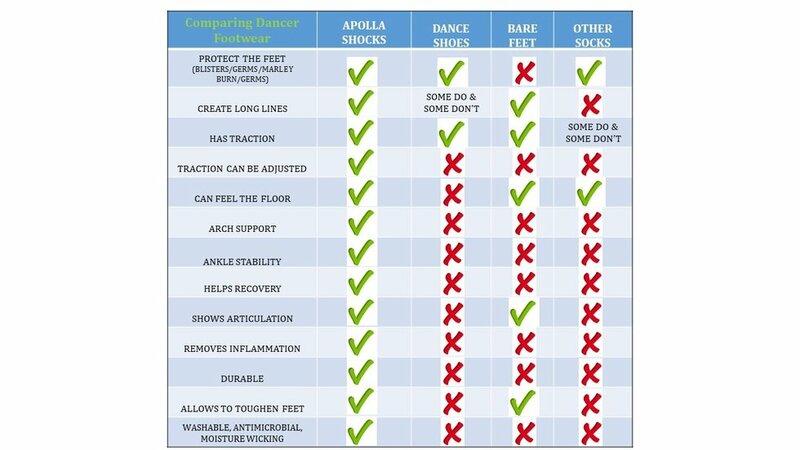 To understand better, we asked some of the most trusted dancers, choreographers, and physical therapists in the dance community why they recommend Apolla Shocks? Melody Lacayanga (Dancer, teacher, choreographer on faculty with Art of Movement Dance Convention & STYYCD All-Star)”Apolla saved me! As dancers, teachers and choreographers, we are always on our feet. I myself began suffering from plantar fasciitis a few years ago. I always worked through the pain, even on days when it was so bad I could barely walk. Since wearing the Apolla Shocks, the pain has decreased immensely. I rarely have pain now! I love the compression and flexibility of the sock, which offer the necessary support and stability, yet allowing maximum articulation through the foot. The option of having traction was also a serious game changer! I don’t do very much activity without my Shocks. I even wear them in my sneakers while doing cardio and while traveling on planes. The biggest plus for me is not having to deal with pain, and that has allowed me to enjoy my passion for movement that much more. 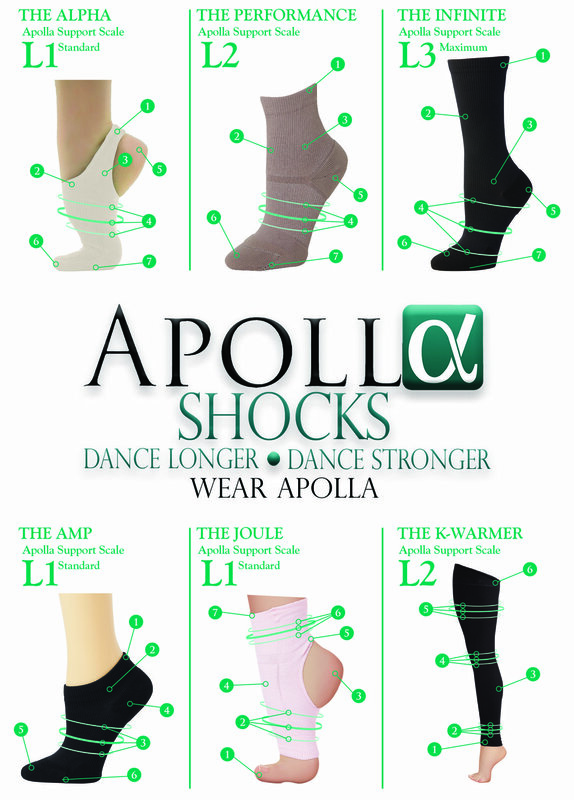 Apolla is a must have for dancers and athletes at any level!? Who and what is Apolla?Shocks are created by Apolla Performance Wear. Apolla is an all-female owned startup that makes 100% of their products in the USA and the creators are all former dancers. They are a company that based this new footwear in sport science research while preserving the traditions and aesthetics dancers hold dear. DID YOU KNOW? Dancer injury rates are TWICE the amount as football players from the knee down. It’s true! Most of those injuries are caused by overuse, repetitive strain & inflammation (65% from the knee down). This inflammation causes pain and aches which can lead to chronic injuries. What exactly is compression?Compression feels like your feet and ankles are receiving a nice, snug hug and it’s used regularly by athletes all over the world for training, performance, and recovery. It will feel different but in a good way. Apolla uses compression levels that are high enough to effectively lift the plantar fascia in targeted insertion points on the arches to help keep it lifted and supported. It also helps to stabilize the ankle’s tendons and ligaments. This is very similar to the support you get from taping except it allows for better movement and comfort. This compression helps remove the inflammation, which in turn helps you ache less and feel better…so you can dance longer & dance stronger! Emily Bufferd (Choreographer, teacher, producer Young Choreographer’s Festival)” My Apolla Shocks save my #dancelife on the regular. I teach in them, fly in them, and sometimes even sleep in my legwarmers – the compression they provide keeps my feet and calves feeling good for long periods of time, and provide helpful support for an old injury. Gratitude for Apolla’s existence!”Magic socks…why NOT?WAIT, we know what you are thinking. They are just socks, right? I don’t allow my kids to wear socks. They must wear dance shoes. They must be barefoot etc,etc. To which we say no, they are Shocks! Apolla has patented compression technology along with grip that really make them so much more than socks, they are like a shoe…thus why Shoe + Sock…equals the aptly named Shock! We also wonder about the injuries we are exposing our dancers to by forcing them to dance without any support or protection in traditional dance shoes or bare feet. SO, we pose this question to the dance community: Why NOT? For years, dancers have worn dance shoes they think make dancing easier. What they are told is “correct” to wear in a certain style for class. Or wear what is “traditional.” The truth is, the footwear options available to dancers are often poorly made, uncomfortable, and offer zero support. There are also many dancers who refuse to wear dance shoes and wear regular socks that can be dangerous without traction, offer zero support, are ill-fitting and do not last. Others just opt to go barefoot which creates sanitary concerns and does not help with supporting or protecting the dancer’s feet. We have dance teachers that can only teach in tennis shoes because they are suffering from chronic injuries like plantar fasciitis.…Shouldn’t we be looking to stop this cycle? We can do better for the future of dance. When dancers suffer from career ending injuries way too early or are plagued with chronic injuries, we should be looking to advance the dance community with sport science technology like all other athletes are doing. From our investigation and testimonials from industry leaders, Apolla Shocks don’t inhibit you from feeling the floor and even have styles that allow you to dance barefoot to build calluses but still give you the support you need. Additionally, Apolla Shocks have a revolutionary traction, show off the feet, come in colors that compliment any line, and are durable. They outperform “dance shoes” in every way! It has become clear why so many of our most trusted dancers and mentors have adopted The Shocks as their go-to footwear. What about the price?Looking at the cost of the Apolla Shocks, if you think of them as a regular sock it may seem high. However, we learned they are a premium product and if you research high quality compression socks in a running store, they are quite a steal! Plus, once we discovered how durable they are, we felt it was comparable to any dance shoe. Some dance shoes you are going thru every 3 months and Apolla Shocks guarantee they will last 6-9 months. Since these give you support and dance shoes don’t, but Shocks last longer…you can make your own call on if the price is worth the investment. In conclusion!If you made it this far in the article and still say, “Sorry… I’m old school…this just won’t work at my studio.” We ask, have you tried them yet? We feel the evidence presented in this article makes them worth a try. We ask you to consider all the traditions that have been changed with the advancement of education, not only in dance but all athletics and throughout history. As we learn a new way of doing something more efficient, we adapt and adopt. It is not that we have been doing anything wrong…it is that we didn’t have any other options until now. Something new IS here, so we hope you consider that maybe…just maybe, it is time to evolve as artists do and reconsider what is “acceptable footwear” for our dancers. Let’s protect the future of dance and give dancers the gift of a life filled with their passion and longevity to do what their body and soul crave…to dance longer and dance stronger! WE recommend Apolla Shocks! Go to www.apollaperformance.com to Learn More about this revolutionary footwear.